How do I determine how much power is left on the battery? 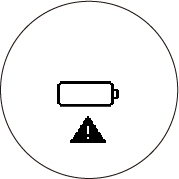 The battery icon on your watch screen displays the remaining level of power in the battery. When the battery is too low, the screen may go blank. Charge your watch at least once every 6 months when you are not using the watch; long-term storage of the watch with a low battery may degrade battery performance. Note: Operation time also varies depending on the operating environment's effects on GPS reception and watch settings, such as backlighting. When you are not using the watch for a workout, the remaining operating time for your watch varies, depending on the features enabled on your watch.